Anterior cervical diskectomy and fusion (ACDF) remains the gold standard procedure for the surgical treatment of cervical disk herniation and cervical spondylosis that produce intractable neck and or radicular arm pain that is unresponsive to conservative methods of treatment. It is also used in cases of cervical disk herniations and cervical spondylosis causing nerve root and spinal cord compression that result in radiculopathies and myelopathies with motor and sensory deficits. The use of the operating microscope has resulted in a safer and more complete decompression of the spinal canal and exiting nerve roots. High speed pneumatic drills and the development of fine microsurgical drilling technique, for example, skull base egg shell drilling, have advanced the art of removing the offending anterior compressive osteophytes and herniated disk from the dura and nerve roots. In the majority of cases, osteophytes must first be drilled out and removed before the disk herniation can be adequately identified and removed. The decompression has become wider and more complete with the development of this microsurgical technique. We attribute a large part of the success of this procedure to the proper decompression of the dura and nerve roots. The reported success rate for relief of pain is around 78% for ACDF (1). The procedure takes 1-1.5 hrs to perform for a single level and in the majority of cases, patients go home the same day. Given the high rate of success for this procedure, why is there interest in a revolutionary change from fusion to artificial disk replacement? The answer lies in the “fusion” aspect of the procedure. Pseudoarthrosis, or the failure of the bone to fuse with the adjacent vertebral body, can occur following the ACDF procedure. This can cause foraminal stenosis and recurrence of symptoms. Another reason for interest in artificial disk replacement is something called adjacent segment disk disease. Following ACDF, once fusion takes place there is no movement in the joint. The joint can no longer do what it was originally intended to do, that is, to perform its share of work as a member of the array of joints that allow a full range of motion in the neck. 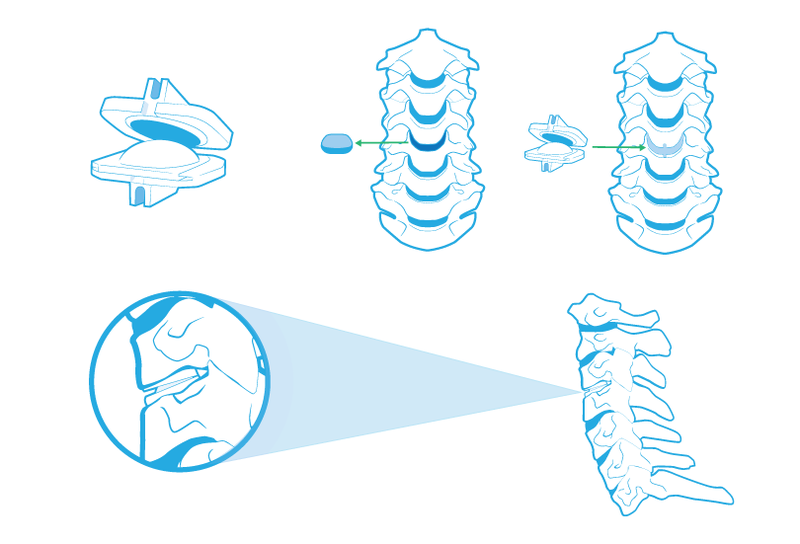 The fusion of one level is felt to create greater stress on the remaining “movable” joints leading to their early failure. Both of these problems can result in the need for another operation. Preserving motion while still achieving the necessary important decompression of the offending disk, theoretically can greatly reduce healing time (especially in smokers) and reduce the need for re-operation by avoiding pseudoarthrosis and reducing the effect of adjacent segment disk disease. Preserving motion of the operated disk segment may also improve the success of pain relief by restoring the segment to it’s more natural function of motion and reduce the excess strain on the other segments of the cervical spine. Reference: 1. Silvers HR, Lewis PJ, Suddaby LS, Asch HL, Clabeaux DE, Blumenson, LE: Day Surgery For Cervical Microdiscectomy: Is It Safe And Effective? J Of Spinal Disorders 9:287-293, 1996. Hello! I've been reading your weblog for some time now and finally got the courage to go ahead and give you a shout out from Huffman Tx! thus it's nice to read this weblog, and I used to visit this blog everyday. IE nonetheless is the market leader and a good portion of other folks will omit your great writing due to this problem. just use web for that reason, and get the latest information. I am thankful that I found this website, precisely the right info that I was searching for! the subject material is rattling good :D.
because this occasion i am reading this impressive informative article here at my home. Real nice style and excellent content, hardly anything else we need :D.
I'm not writing all that over again. Regardless, just wanted to say superb blog! Some really wondrous work on behalf of the owner of this internet site, absolutely outstanding content material. I've read this put up and if I could I wish to counsel you some interesting things or advice.